With shortages of dentists across the United Kingdom (UK), now is one of the best times to consider a career in dentistry. Dentists have a career in diagnosing and treating various diseases and injuries of the mouth, teeth and gums. A dentist also plays a vital role in directing patients on how best to look after the mouth though dental care, which can then help problems from arising in the future. As such, a dentist not only helps to prevent problems in the mouth, teeth and gums, but they also treat problems if they do occur. As a dentist, you would have the opportunity to take an active role in educating patients on proper oral hygiene. To become a dentist, you need to complete a degree in dentistry from a recognised university. It can be extremely competitive to get into a dentistry course and the program will usually last five years or more. You will take subjects such as anatomy, pathology, psychology, biochemistry and numerous other science courses. You will also complete a practical component, which ensures that you can put the theoretical learning into practice. Upon completion of your education, you would have to register with the General Dental Council as well as work under supervision for some time in an established dental practice. For those who want to work in a hospital setting, you would have additional practical training in a hospital. As with the majority of health care professions, you would need to undergo continuing education throughout your career, which would allow you to learn new techniques and treatments as they are developed and introduced to the field of dentistry. You can also specialise in areas such as cosmetic dentistry, which is in high demand right now. For the most part, the average dentist will work as a general practitioner and will be employed by the National Health Service (NHS). In a typical day, a dentist will look at each patient's mouth and will also inspect their teeth, gums and mouth for indications of problems. Diagnostic equipment such as x-rays will be used where necessary as well. 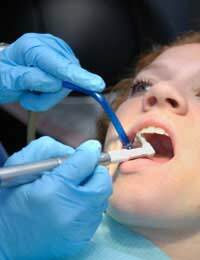 A dentist may also administer anaesthetic or fill decayed areas of teeth. Surgical procedures such as wisdom tooth removal are commonly performed. As a dentist, you would extract teeth, perform root fillings and also fit patients with crowns and dentures to ensure that their teeth are filled and complete as well as functional and attractive. You would work as part of a dental team, which would include dental nurses to assist in surgery and dental hygienists to assist patients with hygiene and preventative dental care. You can also choose to work in community dental care, where you might participate in dental education campaigns in schools and in the general public. You might even perform house visits for those who are unable to attend a general practice. Dentists who work in hospitals tend to work on more complex dental conditions such as abnormalities in the face and jaw. To work well as a dentist, there are some important qualities you need to develop during your training. You should be a very relaxed, personable and calm person who can reassure patients during treatment. For some people, the idea of going to the dentist is akin to torture. Dentistry is simply one of those unfortunate professions that is misunderstood and has gained an inaccurate reputation as a painful part of life that is to be approached with dread. In truth, however, your work as a dentist will allow you access to the most modern technology for preventing pain and ensuring the comfort of your patients as you successfully perform dental treatment. By developing strong communications skills, you can speak clearly and effectively with your patients. As a dentist, you also need good hand-eye coordination and the ability to educate patients on proper dental care. You should generally enjoy the sciences and have a deep care for facilitating good oral hygiene and treatment in patients. Most dentists make approximately £77,000 to £83,000 although this figure does vary depending on the environment you choose as a dentist. Those who specialise in cosmetic dentistry enjoy some of the highest salaries of any health care professional. Given the shortage of dentists, you can expect a stable career and many choices when deciding where you want to work as a dentist. Clearly now is one of the best times to consider putting your interest in dental care into practice by embarking on training to become a dentist.